I know I said I probably wouldn’t find the time to post again this week, but I served these at a big family get together just a couple of days ago, and they were a big, mouth-puckering, fruity hit and I really think you’re going to want to have them in your repertoire. 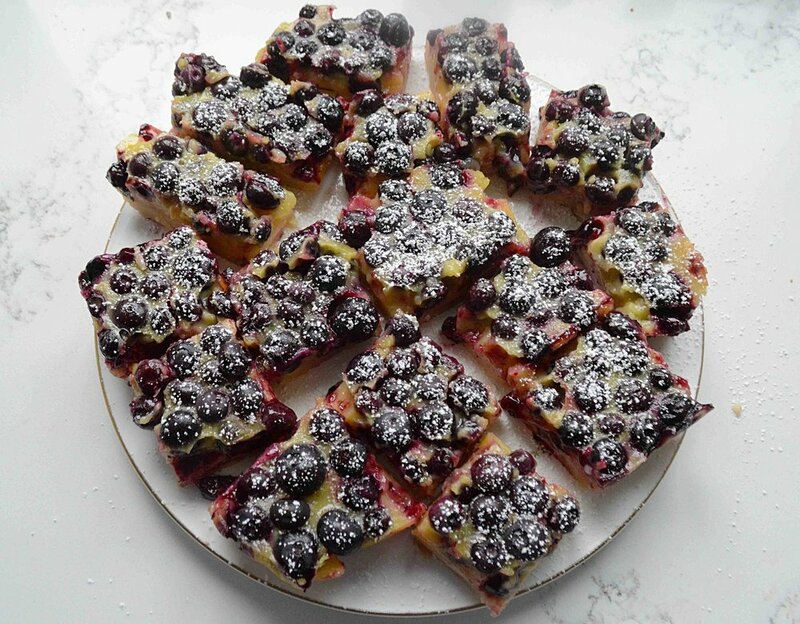 They’re fairly easy to whip up and can be made ahead, which makes them pretty perfect for any picnics or bbqs you have in the near future (hint,hint July 4th) If you find it hard to choose between lemon and blueberry, these yummy bars will give you the best of both worlds with every bite! I can’t believe it’s taken me this long to add blueberries to a classic lemon bar. Not only do they look so pretty against the yellow, but they add a pop of natural sweetness too. And particularly with this lemon curd, which is on the tart side, the berries really balance things out. 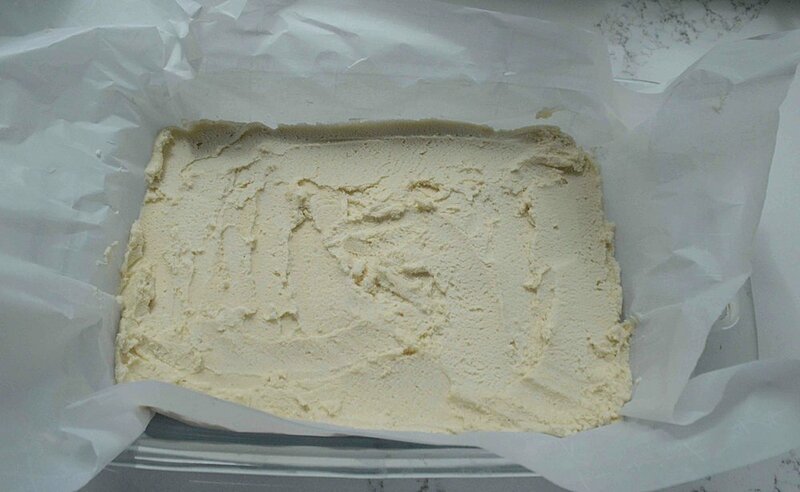 You start by making a simple press-in shortbread crust. While that’s baking, you whip up the lemon filling, eventually skimming off the foam. Then, all that’s left to do is pour it over the hot crust, scatter with the berries and bake. After a short stint in the fridge, you dust these babies with a little powdered sugar and...😄😄😄 blueberry lemon magic! Yum!! Prep Time for crust: 5 minutes; Bake Time for crust: 25 minutes: Prep Time for Filling: 10 minutes; plus an additional 20-25 minutes of Bake Time and at least an hour or two of chilling time. 1. Preheat oven to 350º F. Spray a 9 x 13-inch baking dish with nonstick cooking spray and lime with parchment paper, allowing for a generous overhang. Set aside. 2. To make the crust: Use an electric mixer to beat the butter and sugar together on high speed, until the mixture is fluffy and light, about 3 minutes. In a separate small bowl, whisk the flour and salt together. Turn the mixer to low speed and gradually add the flour mixture, scraping down the sides of the bowl with a rubber spatula as needed. Turn the mixer to high again and beat for another minute or so, until the dough sticks together. 3. Turn the dough out into the prepared pan and use a butter knife or small spatula to spread it out evenly, making sure to get it into the corners. The mixture will be sticky so you might want to use your fingertips to help it along. Once you’ve got an even layer, bake it in the oven for about 22-25 minutes, until the edges are just beginning to brown. 4. Meanwhile make the lemon curd: Place the eggs and sugar in a large bowl and whisk together vigorously right away. Add the flour and whisk well and then the zest and lemon juice. Let the mixture stand for a few minutes, then skim off the foam that forms on the top and throw away. 5. When the crust is done, remove the pan from the oven and immediately pour the lemon curd over it. Scatter the berries evenly across the top and return the pan to the oven to cook for another 20-25 minutes, until the filling is barely set in the center—you want it to jiggle just a bit when you gently shake the pan. 6. Transfer the pan to a wire rack and let cool completely. Then cover and chill for at least an hour and up to 48 hours. Cut into 24 bars and dust with confectioners sugar right before serving. Leftovers can be stored in an airtight container in the fridge for a few days. Note: Recipe adapted from Bringing It Home by Gail Simmons. The lemon curd for this is very tart. If you want a sweeter lemon taste, I would definitely add the extra ¼ cup of sugar.